Article first published as Book Review: ‘Papa, Where Are You?’ by PJ Easterbrook on Blogcritics. 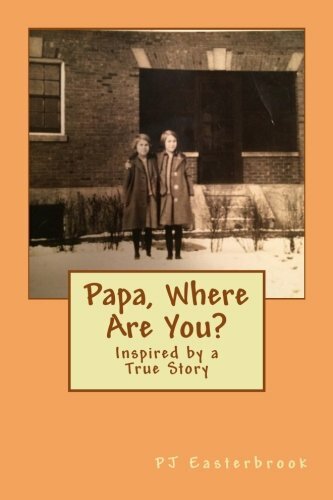 Based on true events from the early 1920s, “Papa, Where Are You?” by PJ Easterbrook is the story of two young sisters who, by a series of perverse and appalling circumstances, are first taken from their family, then separated from their father, and ultimately abandoned to the care of an orphanage. When Betty and Julie Colyer’s mother dies while giving birth to their new baby sister, all three girls stay with their grandmother until their father can arrange to properly care for and raise them. Grief washes over the entire family but consumes Papa, who just can’t seem to cope alone. After some time passes, one of Grandmother’s neighbors tells Papa she will move into their house with him back in the city and help him bring up the girls. Against Grandmother’s objections, Betty and Julie move back to their old home with Mrs. Parkhurst and Papa, while the baby stays with their grandmother. As financial despair troubles the odd new family, Mrs. Parkhurst suggests moving to a new town and starting over. Things only get worse as Papa moves out, leaving the girls with Mrs. Parkhurst, who wickedly shuts down any hopes of the girls ever returning to their family with a twisted and disgraceful story. When Mrs. Parkhurst exhausts all methods of obtaining the financial situation she feel is due her, she poses as the girl’s mother and gives them up at the Park Ridge School for Girls. With the promise to return for the girls as soon as she is settled, Mrs. Parkhurst threatens the girls to keep her secrets. Betty and Julie ultimately become wards of the State of Illinois and when the secrets are finally exposed, social workers spend the next couple of years in search of the girls’ real family. Truth is indeed stranger than fiction, and this bizarre story captured my complete attention, invoking unbelievably strong emotions in me from the very start. The story is well written and captivating, and I couldn’t help but fall in love with the two little girls and pray for their well-being. Told from the perspective of the oldest sister Betty, readers are given direct access into her mind as she tries to make sense of everything, while remaining strong and supportive as she cares for her younger sister Julie. The characters really drive the story. So many times, I found myself shaking my head in disbelief at the actions of Mrs. Parkhurst, but most incredible was the behavior of the girl’s father, letting a complete stranger take over their entire lives. How in the world does something like this happen? It really causes one to think how every little decision we make completely alters the course of existence. Kudos to PJ Easterbrook, for putting to paper a story that needed telling. “Papa, Where Are You?” will remain in the heart and on the mind long after the story is finished.